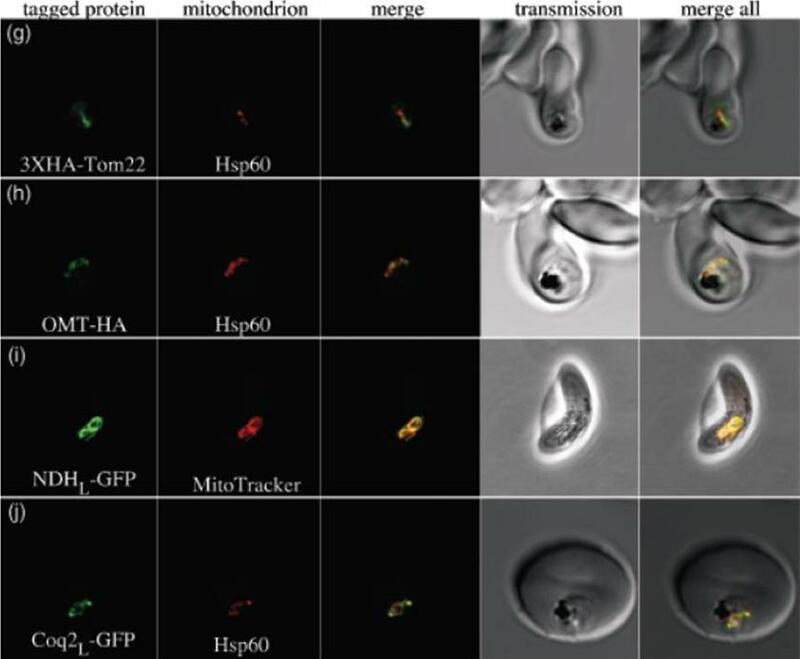 g) PfTom22 localizes to the mitochondrion of P. falciparum. Pf Tom22 was tagged with a 3X-HA epitope tag at its N-terminus. An immuno-fluorescence assay was performed with 3XHA-PfTom22 labelled in green and the mitochondrial marker Hsp60 labelled in red. The merged image (central panel) shows apparent overlap between the two proteins, indicating that PfTom22 is a mitochondrial protein. h) The oxoglutarate/malate transporter homologue of P. falciparum (PfOMT) localizes to the mitochondrion of P. falciparum. PfOMTwas tagged with a 1XHA tag at its C-terminus (green) and co-labelled with anti-Hsp60 antibody (red). The merged image shows apparent overlap between the two proteins, indicating that PfOMT is a mitochondrial protein. i) The single-subunit NAD(P)H dehydrogenase homologue of P. falciparum (PfNDH) localizes to the mitochondrion. The N-terminal extension of PfNDH was fused to green fluorescent protein (GFP, green), with live parasites co-labelled with MitoTracker Red (red), a mitochondrial marker. In this gametocyte image, there is clear overlap, indicating that PfNDH localizes to the mitochondrion. In asexual stages, when protein expression levels are probably higher, a considerable portion of PfNDHL-GFP also localizes to the cytosol, suggesting that import of this fusion protein is somewhat inefficient. j) The coenzyme Q biosynthesis protein Coq2 homologue of P. falciparum (PfCoq2) localizes to the mitochondrion. The N-terminal portion of PfCoq2 was fused to green fluorescent protein and labelled with anti-green fluorescent protein antibody (green). These fixed parasites were co-labelled with anti-Hsp60 antibody (red), with the apparent co-localization indicating that PfCoq2 is a mitochondrial proteinvan Dooren GG, Stimmler LM, McFadden GI. Metabolic maps and functions of the Plasmodium mitochondrion. FEMS Microbiol Rev. 2006 30(4):596-630. Review.